This week, Sega announced that formerly PS3-exclusive Valkyria Chronicles would be coming to PC 11 November, 2014. Just the idea that more people will get to experience this game makes me giddy. Why? Because the Valkyria Chronicles series is my first and only SRPG love. From the beginning, I've never really liked SRPGs. This is probably because, as a middle schooler fresh off of beating Final Fantasy VII, I found there was another Final Fantasy game out on the PlayStation: Final Fantasy Tactics. More than anything else at the time, I played games, especially RPGs, for their epic stories. So I quickly found out that a game of several thirty-minute battles followed by a brief story scene was not my cup of tea. So after a few hours of that I was well and turned off to the SRPGs genre in general. It tells a lot about a game if you remember the exact moment you learned of its existence. For Valkyria Chronicles, I was standing in a sea of humanity, watching trailers at the Sony booth during Tokyo Game Show 2007. What I saw was one of the most beautiful-looking games I have ever seen — both before and since. I knew from that moment I would be buying the game, no matter what type of game it was, for the art style alone. And it's a good thing I did or I would have dismissed Valkyria Chronicles as "not for me" for its genre alone. That said, Valkyria Chronicles is unlike any other SRPG I have ever played — which is probably why I like it so much. Typically in SRPGs, you move the characters one by one on a grid-based terrain. However, in Valkyria Chronicles, when you select a character, the game transitions into a third person, over-the-shoulder viewpoint. From there, you can move the character across the map at will — but even though you can typically only attack once, enemies will attack constantly as long as you are in control and in range. Of course, the same can be said for when the enemies move and your units are defending as well. Thus, a lot of the tactics in Valkyria Chronicles is positioning your troops under cover so that the enemy can be cut down if they try to advance during their turn — and figuring out how to break through the enemies' similarly constructed lines. Another aspect I fell in love with was how the personalities of the game's varied cast actually affected gameplay. Is one character in love with another? Then they get buffs when they are together in battle. On the other hand, if the character is an anti-semite then he or she gets a de-buff when around one of the Jewish ("Darcsen") characters. Some characters grew up in the city so they fight better in an urban environment, while other characters prefer the country for similar reasons. As these personality quirks serve to reflect the characters' backstories, it makes them feel like unique, fleshed-out characters even when they aren't part of the main cast. And of course there is the story. 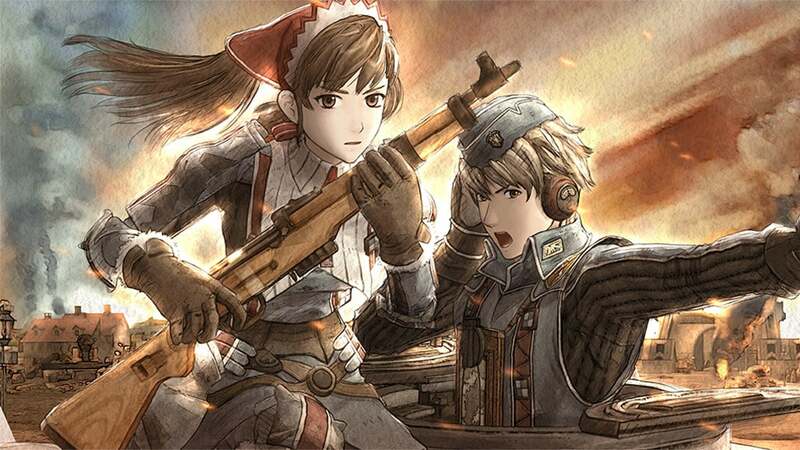 I am a huge World War II buff and a big fan of historical fiction — and Valkyria Chronicles is basically a retelling of World War II in a reality where there is a magical ore that can do anything from heal wounds to power a tank. Beyond the setting, the game is focused on a militia squad — not a normal army unit. This means that the characters are simply normal people for the most part instead of trained soldiers. Your squad includes everything from a lounge singer to a baker — a hunter to a novelist. With a cast of all ages from all walks of life, the cast always interacts in interesting ways. Valkyria Chronicles is an exciting war story bolstered with an excellent spin on traditional SRPG gameplay. In fact, the only SRPG I have enjoyed more is — well, the sequel, Valkyria Chronicles 3. So if you like RPGs, SRPGs, historical fiction, war stories, or games with unique characters — and you missed out on the PS3 release — make sure you give Valkyria Chronicles a try when it comes out on PC on 11 November. Lets hope they keep releasing PS3 games on PC, plenty of gems in that lot. Such a great game, which I never finished due to difficulty. All this talk makes me wanna dust off disc and try again. I found fire emblem awakening more fun tbh. never played this game, but the anime on the other hand. You just convinced me to buy it. The third person movement and the buff/debuff system sounds great. I remember standing in that crowds at TGS 2007 and watching the video. I thought "huh. Looks cool" and promptly forgot about the entire series. Seems like that was a mistake.